Glasgow Punter: Famous George Square Statues To Be Removed....eh, What Famous Statues? Famous George Square Statues To Be Removed....eh, What Famous Statues? Plans to redevelop George Square have caused controversy. Do you even know what is there just now? I was interested to read all the debate in the Herald newspaper letters pages after it was announced last week that the "famous statues" from George Square are being "temporarily" removed for renovation ahead of a planned revamp of the square. Again on Radio Scotland news today they spoke above the removal of the "famous statues". It has not yet been decided whether the square should be a site for events and meetings, a place of cafes and entertainment or a grassy area to meet up in. That all depends on who comes up with the best plans from the forthcoming tendering process. One thing is clear however, something has got to change. I went along today to George Square with a more critical eye than usual after reading these reports. Over the years I've sat on the benches having a Greggs sandwich, I've attended a demonstrations, concerts and a speech by Nelson Mandela, I've started races from the square and fed the pigeons but never really stood back and looked at it, the way you would on arriving in a city's main square overseas on holiday. Even looking at the red tarmac on a crisp autumnal morning like today through rose-tinted spectacles you'd have to acknowledge that it's a bit shabby. There are two questions that the debate in the newspapers has been asking. Should the statues stay or go? What should the future George Square be like? I quite liked the suggestion that the statues should be moved to more relevant locations about the city and not just kept in place for the sake of nostalgia. Also it is easily forgotten that the statues of the square and Glasgow in general have been moved around like chess pieces since the day the first one was erected. For example the statue of David Livingstone in Cathedral Square was moved there in 1959 from George Square. There are twelve statues in George Square. Seriously, how many of them can you remember? Off the top of your head how many of them do you know the subject and their relevance to Glasgow? Stop and think about it just now before you read on. In the meantime here is a photo of me aged about 8 months old enjoying the good olde days in George Square when there were more grassy bits to lounge about on. This was me on a summer's day when an Indian sailor on leave in the city thought my wee family looked sweet and took a photo of us and posted it back to my hippy parents. Strange, but true. Before going for a look at them I was able to name from memory three of the statues; Robert Peel, Robert Burns and Sir Walter Scott in the middle. I think I'll give myself a half point for remembering the cenotaph structure also. Co-incidentally somebody last week bought me a wee gift from a Brighton bookshop for £1, a lovely book called 'Public Sculpture of Glasgow' by Ray McKenzie. So I decided to go and see which statues the council is planning to remove and see what I could find out about them from my new book. Funnily enough I pitched up on the day that some lorries arrived to start putting up the neon statues of the Christmas decorations, seeing as it is now the 8th of October. There are no plans to remove or renovate the cenotaph. Reading my new book I see that the site for this caused some controversy at the time of its construction as it was felt it blocked the view of and from the City Chambers. However, built in 1924 to a design by Glasgow architect John James Burnet it was felt to be "hallowed ground" as the site where soldiers were recruited and from where they departed to the war and where they took the salute on their return home. It is worth noting that statues in other locations around the square were moved around in 1924 to accommodate it, namely those of Queen Victoria, Prince Albert and Gladstone. Looking at it today its effect as a statue is pretty diminished by the fact that it now appears to be surrounded in Leylandii and shrubbery which obscures a lot of it. Also the front of it is fenced off stopping you from having a proper look at it. If it is to be a permanent feature of the square it surely has to be made a feature of the square, rather than camouflaged as it is at present. Although the Scott Monument on Edinburgh's Princes Street is more well known, it came 10 years after the world's first public monument to the internationally famous author of Rob Roy, Ivanhoe and Waverly. Scott died in 1832 and 6 years later this statue by John Greenshields on a column by David Rhind was erected in the centre of the square. Although it is fare to say that he has almost no specific connection to Glasgow, he was and is one of the world's most widely read authors and an inspiration for many. He is maybe blamed a wee bit these days with playing a big part in inventing the shortbread tin, tartan tourist-stereotype of Scotland, but nobody would argue that Scott is a Scot of renown. The 'monument committee' was formed less than a month after his death to create a "means of inspiring others to emulate that great and glorious man". The Glasgow Herald in 1838 noted that the column was "too long for its girth, and more like a good walking stick than anything else". I'd have to agree - you can't see the statue from anywhere in George Square really, can you? From as early as 1924 it has been suggested that it be shifted to a site more appropriate to its scale, and that it raises Scott too high above Robert Burns's lowly statue in an inappropriate manner. There is a myth that the sculptor, Greenshields, flung himself to his death from the top on realising the plaid was over the wrong shoulder. This isn't true as Greenshields designed it then died two years before its completion by John Ritchie. Also Scott is meant to have his plaid over the right shoulder to show he's a native of the Borders, rather than a Highlandman. If you had to guess which statue is the oldest in George Square take 3 points if you said Sir John Moore, who was the first person immortalised as a statue in George Square. He was a Glaswegian, born in the Trongate who served with the Duke of Hamilton in America and also fought in the Mediterranean, the West Indies, Ireland, Egypt and Holland. He earned a reputation for training infantrymen and fought Napolean in the peninsular war, where he defeated the French army in the Battle of Corunna, but died of his wounds. Unveiled 10 years later in 1819 this bronze statue was made by John Flaxman. The statue was cast from bronze salvaged from cannon "captured or surplus at the end of the Napoleonic Wars". The locals didn't like their green, where they hung their washing, becoming a space for public monuments so it was often vandalised and attempts apparently made to topple it in its early days. Originally he held a sword in his left hand, which is missing now. The next statute to be put up in George Square was that of the inventor and engineer James Watt. Born in Greenock he is most famed as the designer of an efficient steam engine which revolutionised industry and remembered in the unit of mechanical and electrical power. He also worked on designing the Forth and Clyde Canal. The statue by Francis Leggatt Chantrey has him seated 'in a contemplative mood, with compasses in the right hand and a scroll lying on the knee, on which is described the model of a steam engine'. Four other versions of this statue were made in marble by Chantrey, one of which was once in Westminister Abbey and now sits in the Hunterian Museum at Glasgow University. Nobody surely would argue with James Watt's relevance to Glasgow and importance on the world stage. Although they stand as a pair at the western end of George Square at present, these equestrian statutes have moved about a bit. Queen Victoria's was made first and stood in St Vincent Place from 1854 before arriving in George Square in 1866. So it's a youthful Queen Victoria sitting side-saddle on her horse with an imperial sceptre in her hand. She does look a bit like a queenly chess piece with that crown on her head. The friezes around the base depict her visit to Glasgow in 1849. Sealed within a cavity in the plinth is also a time capsule, a bottle containing documents from the visit and newspapers of the day. Both statues were done by Carlo Marochetti, whose famous statue of the Duke of Wellington outside the Gallery of Modern Art in Glasgow is now an iconic image of the city, as it is usually permanently adorned with a traffic cone. Wellington's statue was already on display in Glasgow and several contemporary articles on the new Queen Victoria statue compared it unfavourably with what had gone before, saying she looked too small and insufficiently imposing. Prince Albert's statue was unveiled in 1866, five years after his death, and at that time Queen Victoria's statue was moved to bring the pair to George Square, positioning them east and west of Sir Walter Scott at the centre. At this time the city council's investigations found that they in fact owned the square and not the local residents who thought until that time that they did and had objected to the imposition of all this statuary. So the council took the opportunity to re-develop it and laid it out in 1866 pretty much as it still is to this day. From their position in 1866 their majesties trotted westwards a few yards 58 years later when the cenotaph was built. Albert also has a bottle of contemporary memorabilia hermetically sealed within the base of his statue which depicts Education, Industry, Agriculture, Commerce and the Fine Arts on the friezes of the base. Although it was proposed by Alexander 'Greek' Thomson that a statue be erected in Kelvingrove Park to commemorate Albert after his death in a building 'similar to the Temple of Theseus in Athens', once Queen Victoria was consulted she suggested an equestrian statue by Marochetti and that was the end of that. Although it may be regarded as rather uninspiring to modern tastes, Victoria seems to have liked it and had a replica placed in Windsor Park. The son of a wealthy landowner and merchant, James Oswald of Auchincruive was a liberal politician twice elected as an MP for Glasgow. Erected in 1856 in Sandyford Place this statue was moved to George Square in 1875. Why? 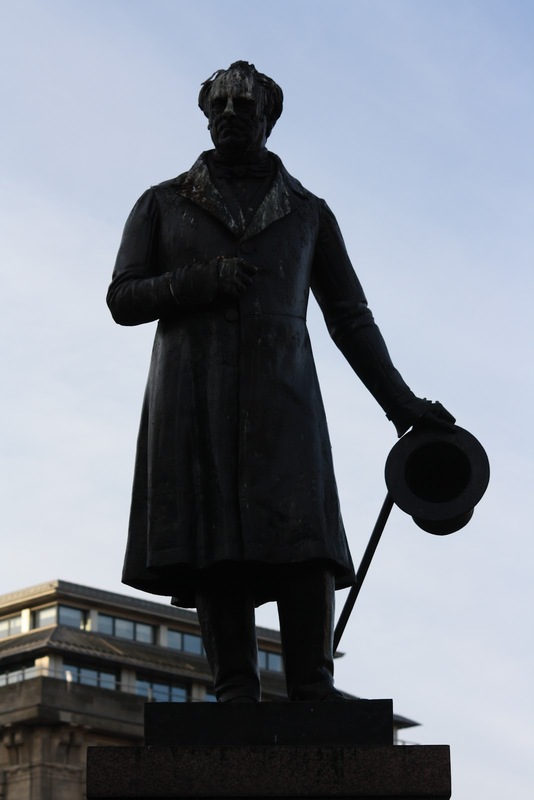 By then Robert Peel, his political opponent, had a statue in the more prestigious square and Oswald's family and supporters petitioned the council to get him upgraded. Again it is by Carlo Marochetti, but was unusual in representing him in contemporary clothing. Apparently it was known for decades as "the man with the hat" and children would while away the hours in the days before they had Playstations trying to throw stones into his hat. I like the story that Neil Munro invited Joseph Conrad to try to get a stone into the hat whilst they were dining in a nearby hotel to become "an honorary Glaswegian". After a few goes he succeeded and they returned to their dinner. Sculpted by John Mossman this statue of Sir Robert Peel was erected in George Square in 1859. This is one of the ones which has always made me go "Eh?". Like most people I know him as an English politician responsible for establishing the Police force in London, "the Peelers" or "Bobbies" as nobody now calls them. Born near Bury he became leader of the Conservative Party, Home Secretary and was twice Prime Minister. It seems that shortly after his death a statue was proposed to acknowledge that he had "conferred great benefit on his country". The choice of a local artist for a large public commission in Glasgow was a first at the time and it was Mossman's first statue in bronze. Born Colin McLiver in Glasgow in 1792 and educated at the High School of Glasgow he joined the army aged 15, serving under John Moore in the Peninsular War (see no.3 above). He had risen to the rank of Field Marshall by the time of the Crimean War and commanded the "Thin Red Line" of the Black Watch at the Battle of Balaclava. By 1857 he was Commander-in-Chief of the Indian Army during the Mutiny. 'Old Careful' may not have had the greatest nickname in the world, but he was popular with Queen Victoria and made Lord Clyde in 1858. The statue, by John Henry Foley of London, has him with pith helmet, telescope in left hand resting on a palm tree fresh from his exploits in India. It required a slight reshuffling of statues in the square with John Moore nudging up a bit. This lead to an outcry in the letters page of the Glasgow Herald. Does that sound familiar? Back to the sciences now for the next statue to arrive in George Square. William Brodie's statue to Thomas Graham sits in the south east corner. Born in Glasgow, he studied Chemistry in Edinburgh before teaching in Glasgow (where David Livingstone was his student). He then moved to the Chair of Chemistry at University College, London where he carried on his researches, the best known being "Graham's Law" on the diffusion of gases. He is seated in contemplation as is James Watt at the other southern corner and Lord Kelvin in Kelvingrove Park. Presumably men of science sit and ponder a lot whilst soldiers stand and thrust. Scotland's national bard should need no introduction. If religious sculptures are excluded, the only people with more statues to them around the world than Robert Burns are Queen Victoria and Christopher Columbus. However it was 1877 before George Square was graced with one, 81 years after his death. He is represented by George Edwin Ewing and Francis Leslie here as a 'superior Scottish peasant' with his 'broad Kilmarnock bonnet' crushed under his right elbow and a 'wee crimson tipped flower' in his left hand whilst in 'an easy and graceful attitude of poetic contemplation'. There are panels from three of his poems on the pedestal. Unlike any of the other statues here, Burns's unique popularity meant that it was funded in a quite different way, with subscriptions from around 40,000 people of a shilling each to reach the required fund of around £2000. A local artist was given the task of creating the work of a figure who had by this time achieved mythical status and he based it largely upon Alexander Nasmyth's famous oil painting. A crowd of over 30,000 people were in George Square on the date of the bard's birthday in 1877 to witness the unveiling. The poet, political commentator and historian Thomas Campbell was born in Glasgow in 1777 and although maybe less known now, was Glasgow's most popular poet of his day. In later years he became involved in founding the University of London and he is buried Poets' Corner at Westminster Abbey. His statue was proposed because it was felt to be an important omission in the city that needed rectifying, and Mossman's statue was erected in the year of the 100th anniversary of his birth. Liverpool born politician, William Gladstone, was Prime Minister of Britain four times. He was awarded the Freedom of the City of Glasgow in 1879, and like Robert Peel before him, he was also Lord Rector of Glasgow University. It is the robes of Glasgow University that he is depicted in by William Hamo Thornycroft in this sculpture which was unveiled in 1902. After his death in 1898 several British cities swiftly responded by commissioning sculptures of Gladstone. In this one the sculptor has apparently tactfully made it appear he has his index finger tucked between the pages of his book, to disguise the disfigured remains of his finger which resulted from a shooting accident. One of the panel reliefs on the side of the pedestal has him addressing parliament, the other has him 'engaged in his favourite recreation of tree felling'. That's the way to be remembered, eh? It was originally placed opposite the doors of the City Chambers and moved to its current location to accommodate the cenotaph. The point is fairly self-evident once you actually look at them, that the current collection of statues reflects the fashions and tastes of the time they were commissioned. There is no overall plan and the square was adjusted and tweeked as required. It looks rather like a collection of Victorian graveyard statuary really. So I am now, on reflection, happy to accept that the lay out of the George Square is not set in stone and could be radically improved. The problem is that nobody trusts the City Council to do it properly. The roads at either end could easily be blocked off to make it more pedestrianised, the parking around the sides of the square could also be covered over to expand its width to make a grander public space. The statues could be better accommodated elsewhere. Create a poets corner in Queens Park with Sir Walter Scott, Robert Burns and Thomas Campbell. Move the scientists alongside Glasgow University in Kelvingrove Park with Lord Kelvin. Queen Victoria to Victoria Park or a promenade of politicians in Glasgow Green? So what to put in their place? A "jet d'eau" was a feature of the square before Sir Walter took its place, but the council don't have a great reputation for maintaining fountains as the on/off nature of the one in Kelvingrove attests, although the Dalton Fountain in Glasgow Green seems to be still working since its renovation. What about jets of water as they have in the courtyard of Somerset House in London? This seems ever popular and feature annually as big pictures, with children running through them, in newspapers to let you know whenever a hot day has occured. Any plan will inevitably have a source of income built into it these days I fear, so there won't just be green spaces planted for people to picnic in, so any catering facilities or bars need to be decent and to be maintained rather than a selection of caravans like you get at the Christmas fair in George Square. What about commissioning new public art in the city which continually produces outstanding Turner Prize-winning artists, but has very little of their stuff on public display? You could move the "La Pasionaria" statue up from the Clydeside to stand alongside the cenotaph to commemorate the Glaswegian volunteers who joined the anti-Fascist forces in the Spanish Civil War. A statue of John MacLean could commemorate the Red Clydesiders, or something to mark the site in George Square where strikers raised a red flag in 1919, believing revolution was imminent, before the soldiers arrived from outside the city as the government feared they couldn't trust the local regiments? Here are three examples of public sculpture from the streets of Glasgow showing what can happen. King William III (King Billy), used to sit at Glasgow Cross. Built in 1734, the city's oldest sculpture, and with a bizarre articulated tail which sways in the wind. Possibly his role as a focal point for certain groups meansthat he is kept discretely in gardens near Cathedral Square, rather than a more prominent position. Whatever the outcome of the deliberations on George Square it MUST remain a public square where people have rallied, danced, met and played for generations. No one trusts the council ... the relevance though of these figures in this square is totally questionable. I am trying to compose a tour starting in Georges Square and they are not helping, apart from Rabbie and Watt.